Is the Buccaneers’ big announcement uniform related? With a tweet so vague, it could be anything. They could be announcing a major coaching staff change. Warren Sapp might join the organization or they may be signing a big player. Or maybe they could be retiring Derrick Brooks’ number. It’s hard to figure out what it could mean so the speculation can begin. Here’s one thing that also came up on the team website today: Jerseys are discounted. The jerseys, originally priced at $99.99 have been discounted to $50. That’s a surprising move. It could be because it’s President’s Day and they’re doing a sale for that. But normally pro teams never have a major discount unless they are trying to rid of old inventory. Big sale for the Buccaneers today. Sales for items on the team store range from 10-25% on average. That’s normal. But when a 50% sale comes along, it’s normally tied a store ridding of old inventory. If that’s the case, are the Buccaneers ridding of their old stock in preparation for a new stock? If so, does that mean new logo and new uniforms? It’s purely speculation. 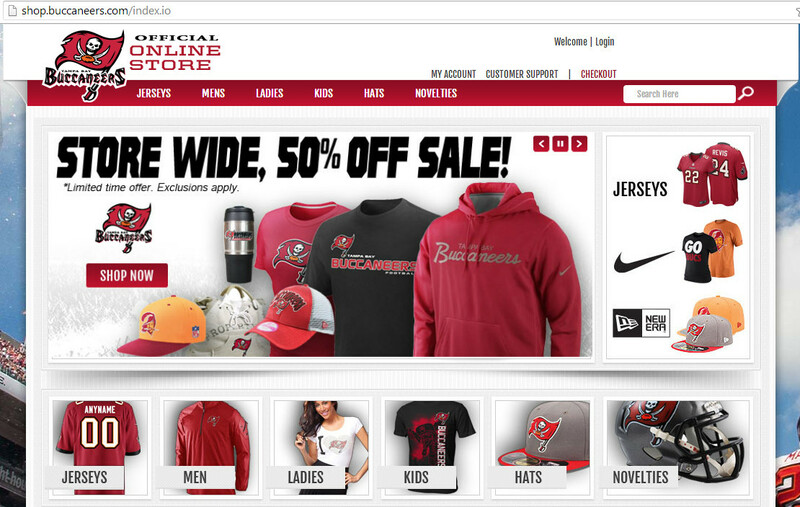 The Buccaneers just could be very generous today with their 50% off. Or it is an indicator that they have changes planned and the announcement will be about that. Take it for what it is. I personally hope it’s not an identity change and rebrand. The Buccaneers have a great look and they should keep it. This entry was posted in NFL, Tampa Bay Buccaneers and tagged Rebrand, Sale. Bookmark the permalink.